Brenda presents Dr Andrew with a $1,000 donation made by the community of Kaslo B.C. 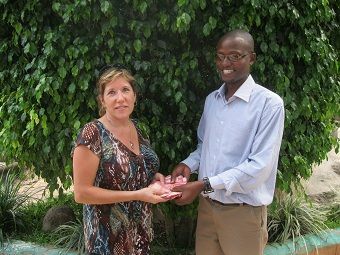 and Kahama Ambassador Elizabeth Ross who took part in the 2009 Trip. 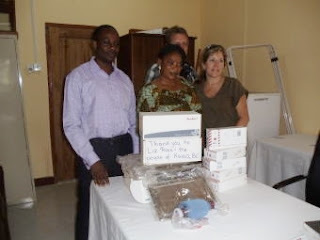 Some of the funds were used to purchase life-saving equipment and supplies for the labour ward - pictured below. Dr. Andrew and the former District Medical Officer Dr. Subi, have worked hard to transform the hospital and many improvements have been made but it is still a massive daily struggle. As with most rural hospitals and clinics in Tanzania there is a shortage of almost everything from medications, to surgery and delivery room facilities to doctors and qualified hospital staff. 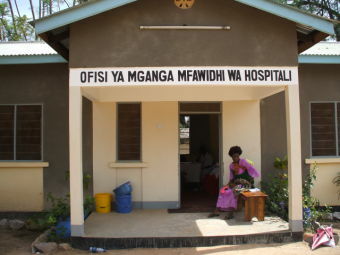 In line with the UN's Global Development Goals, which Tanzania adopted in 2000 (the country had set similar goals as early as 1990) the government has dedicated almost 40% of its national budget to education, health and agriculture but progress is slow, especially in rural areas; the Kahama District Hospital is the only hospital for a population of one million! Dr. Andrew and his staff have an extremely difficult job, with a long road ahead of them, but the United Nation reports on Tanzania in general, and our regular visits to the hospital show that progress IS being made. With extra funding, resources and training lives are being saved and hopeful futures are being secured. We are so fortunate to be able to travel this road with Dr. Andrew and the community of Kahama and to be able to have daily opportunities to make a real and lasting difference. Thank you to all our volunteer-ambassadors for the immeasurable gift of their time and expertise and to everyone who contributes to the continued success of our programs. Click here for pictures of the hospital and staff. ﻿To make a donation send a cheque to The One Person Project, 10108 Julia Street, Summerland, B.C. V0H 1Z5, donate on-line or email me.